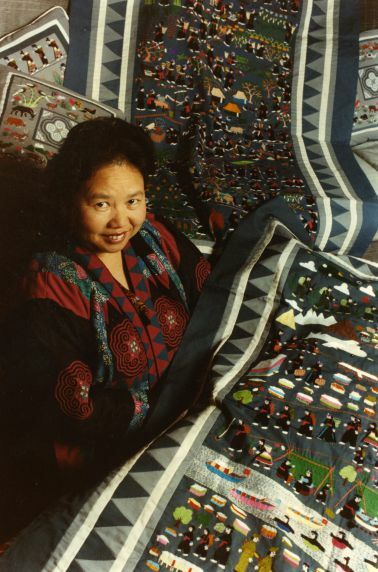 Ia Moua Yang, a Hmong woman originally from Laos, poses with textiles embroidered with imagery from her past experiences. Photographer's notes: "Ia Moua Yang has been a Pandau Artist for the past twenty years. Most of that time she has sewn traditional designs. Recently she decided the tapestry format would be a good way to document a preserve the history of her family and their people for future generations. She feels this is especially important because until recently the Hmong had no written form for their language so that history could be recorded in writing. She has made several tapestries embroidered with the story of the war in Laos, her people's flight from their homes, their escape to refugee camps in Thailand and their eventual emigration to the United States."